SAFETY HARNESS AND INSTRUCTION MANUAL INCLUDED IN RENTAL. 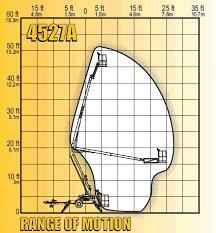 RECOMMENDED THAT AN 1 ADDITIONAL PERSON BE PRESENT IN IMMEDIATE AREA DURING USE. CERTIFICATE OF INSURANCE REQUIRED FOR RENTAL OR CUSTOMER IS RESPONSIBLE FOR ALL DAMAGE TO EQUIPMENT REGARDLESS OF FAULT. NEED A 14' X 14' AREA TO SET UP IN. 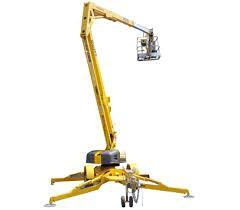 45' TOW BOOM LIFT, ELECTRIC. 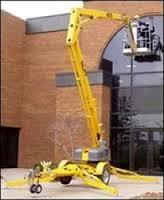 PLATFORM SIZE 4'1" X 2' X 9"
* Please call us with any questions about our 45 foot boom lift in Wilmington, Middletown, and surrounding cities in Northern Delaware.